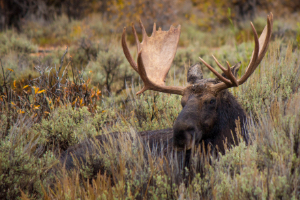 Unit 600 for moose covers approximately 15,064,769 acres, and the dominant land cover is grassland/herbaceous. From September through December The dominant land cover for Unit 600 is grassland/herbaceous. From September through December, this unit receives an average of 0.70 inches of precipitation a month and the heaviest rainfall is in September. Temperatures during hunting seasons typically range from 16°F to 55°F.